PlanetXpo and the Science Fiction Museum & Hall of Fame are proud to announce the 40th Anniversary Conference and Celebration of Star Trek: The show that changed television and our world. 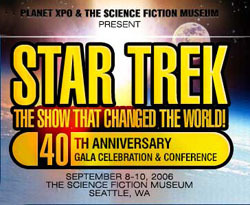 Festivities will be held at the Science Fiction Museum in Seattle, WA, on September 8-10, 2006. Events include a Friday night gala celebration in the Observation Deck of the Space Needle marking the fortieth anniversary of Star Trek’s original air date, September 8, 1966. High above Seattle, this sleek futuristic building, with its SkyCity restaurant and SpaceBase retail store, the Space Needle will perfectly compliment the anniversary celebration. The Science Fiction Museum is the ideal venue offering a futuristic function space in an environment that sets the tone for other events during our conference. Forty years ago, the words “space” and “the final frontier” began a journey that changed the way we see humanity and its future. The museum epitomizes Star Trek and its themes by asking “what if,” inspiring us to imagine ourselves and our future in different ways, and by awakening the dreams of so many young people to pursue careers in the sciences or engineering; thus shaping the world we live in to make the once imaginary future a reality. Star Trek is the most obvious example of how science fiction revolutionized television, and it demonstrates how science fiction can use the media as a form of expression that changes our world. We have gathered an impressive array of individuals who helped to create Star Trek or were in some way influenced by the show. Celebrities, Astronauts, Scientists, Rocketeers, Entrepreneurs, Actors, Authors, and Television Creators, each of whom has been profoundly affected by Star Trek will be in attendance. These are the people leading the way into our Star Trek future. Confirmed guests include: Dr. Buzz Aldrin (astronaut, who, with Neil Armstrong, was one of the first men on the Moon), Alan Bean (4th Man on the Moon), Nichelle “Uhura” Nichols, George “Sulu” Takei, Walter “Chekov” Koenig, Grace Lee “Yeoman Rand” Whitney, and Majel “Nurse Chapel” Roddenberry, as well as Jonathan Frakes and Marina Sirtis of Star Trek: Next Generation Tim Russ (“Tuvok” of Star Trek: Voyager) and many more. Unfortunately, the ultimate Star Trek show at the ultimate venue can only accommodate a limited number of guests. Only 400 lucky Trek fans will be able to celebrate in this intimate and exclusive setting. This could very well be the last significant Star Trek Anniversary celebration. Visit: www.planetxpo.com for further info.